RotoWire took home the most hardware at the eighth annual FSWA Writing Awards. The site claimed awards for Best Baseball Article on the Web (Jack Moore), Hockey Writer of the Year (Janet Eagleson), Racing Writer of the Year (C.J. Radune) and College Sports Writer of the Year (Jesse Siegel). The Sporting News had a strong showing with three awards, including a third straight win for Best Baseball Publication. Matt Lutovsky won for Baseball Print Article and Humor Article. Sports Illustrated claimed Best Fantasy Football Publication for the second straight year. Brad Evans of Yahoo! was named the Football Writer of the Year. Evans is the only three-time finalist in the history of the award; he has won College Sports Writer of the Year three times. Alex Beckey of Baseball Forecaster was named Baseball Writer of the Year. 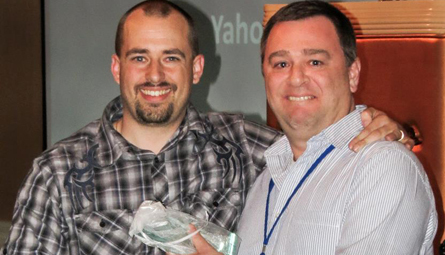 Brian McKitish of ESPN claimed the award for top basketball writer (he also won the award in 2010). Daniel Dobish repeated as Golf Writer of the Year. Brad Evans of Yahoo! collects his award for Fantasy Football Writer of the Year from FSWA Chairman Tony Holm (photo by Nikki Spencer of Urban Exposure).